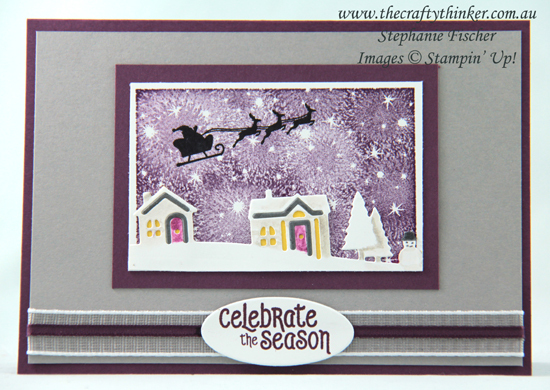 In my last post, I shared this Christmas card that I made using one of the Bokeh Dots background stamps as a starry night sky and promised to show you what I did with the white houses. So this is it. The processes were all very similar except that this time I added a little shading to the houses, trees and snowman with Gray Granite ink and painted the snowman's hat with black ink. I used my much-loved Stamparatus to stamp the santa image to ensure that I got the intensity of black that I wanted by safely stamping repeatedly in the exact same spot. I added some ribbons to the bottom of the card and a label cut with the Layering Ovals framelits. The greeting (from Mistletoe Season) is stamped with Fresh Fig ink.